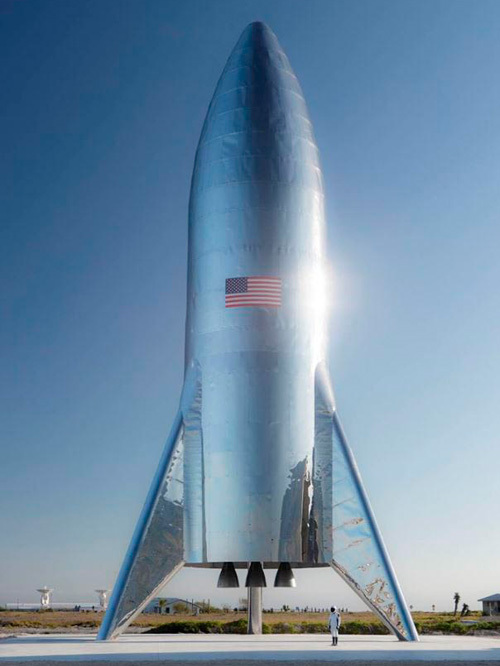 Washington—SpaceX CEO Elon Musk has unveiled the first pictures of a retro-looking, steely rocket called Starship that may one day carry people to the Moon and Mars. Musk posted pictures on Twitter of the Starship Hopper prototype, which awaits its first flight test in Texas in the coming weeks. The prototype built in Boca Chica, along the Gulf Coast of Texas, is nine yards (eight meters) in diameter—like the future rocket will be—but is shorter. Its first test flights—suborbital “hops” reaching several miles (kilometers) in the air before landing back on Earth—could come in March or April.